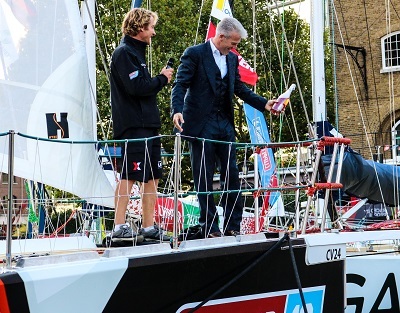 LMAX Exchange is making its ocean-racing debut in the Clipper 2015-16 Race and tonight was its turn to take the show pontoon limelight and officially name its yacht in St Katharine Docks ahead of Sunday’s Race Start. 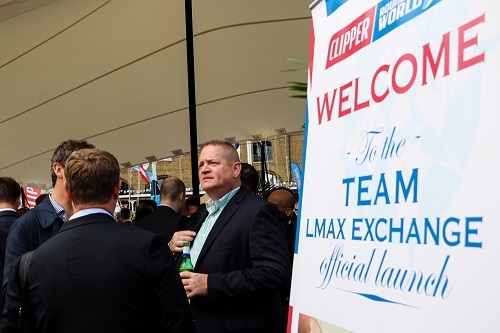 Before soaking the bow of the boat in the obligatory champagne ceremony, LMAX Exchange’s CEO David Mercer told Sir Robin Knox-Johnston and a captive crowd of clients and business associates: “The Clipper Race is a great fit for LMAX Exchange. It means extraordinary feats for ordinary people, and matches our global vision. 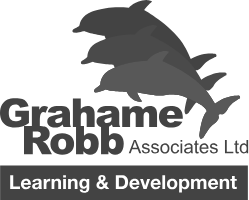 We ourselves have clients in over 90 countries and we’re visiting many of them on this trip. LMAX Exchange has been at the forefront of financial technology in the UK since its inception in 2010. With a growing international client base, the FX company is helping lead the way for UK tech companies looking to take their services overseas. CEO David Mercer is set on expanding this reach even further to become a global leader in FX. 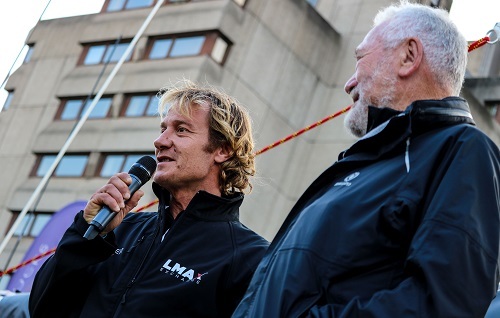 It was then the turn of LMAX Exchange skipper Olivier Cardin to take the main stage. Asked by Sir Robin about how he is feeling as the race draws approaches, Olivier told the crowd: “The preparation for the race is going very well. All the team is very involved and we are working very hard together. Thank you to my whole team for doing an excellent job. “It has been a pleasure to get to know the team at LMAX Exchange tonight. I am particularly very pleased that our sponsor is as ‘racey’ as our skipper. I definitely feel very proud and happy as I am very race driven myself. I didn’t sign up to cruise. We can only do our best but hopefully we get a podium position.